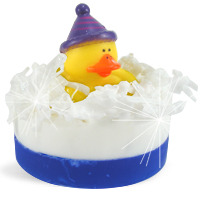 These cute ducks are ready for a spa day, and so will you! We love these soaps as party favors for a spa inspired party…maybe a bachelorette party, birthday party or maybe just a girl’s night in. The scent used in these soaps is a blend of notes including apricot, geranium and cucumber to provide a calming experience. You Save $13.50 by purchasing this kit rather than buying the items separately. COMMENTS: These came out so cute and are very easy to make. It does take a lot of patients though, since you can only make 6 at a time unless you buy extra molds. 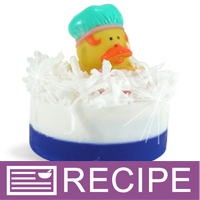 "This kit lists Kit Yield: 24 Soap Bars, but the ingredients only show 12 duck toys and 12 cello bags. How many soap bars does this kit actually make with the ingredients provided? Thanks!" Staff Answer This kit yields 12 bars of soap. We have adjusted the information. Thank you for bringing this to our attention.